The Hindu Vocab 17 Aug 2018, Prepared by Neha Singh. 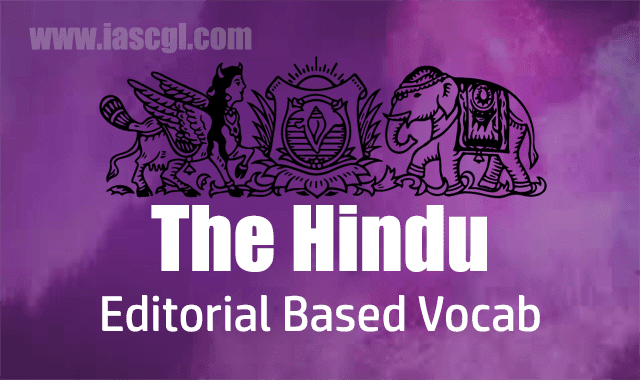 Hello Aspirants, I received many emails from you/users regarding The Hindu Vocab. Daily Vocab will help you in competitive exam link SSC, Bank and State Level Exams. If you like this please comment your review. This will help her to prepare more and best for you. You can check today's(17 August 2018)'s vocab from The Hindu, below. If one word could best describe a man, then for Atal Bihari Vajpayee that would have to be compromise. Ever the contrarian, Vajpayee was equally the consensus-seeker and the alliance-builder who could traverse ideological divides and overcome political animosities with a skill set that was a throwback to the Nehruvian era. A brilliant parliamentarian and a shrewd politician who could demolish political opponents with his acerbic wit, Vajpayee was also the elder statesman who was never afraid to reach out and make peace with India’s neighbours. Without a doubt, he was born of the Rashtriya Swayamsevak Sangh, the torchbearer of Hindutva. But his rise in the Jana Sangh was at a time when it was not on the ascendant, and this meant he always tried to outgrow his organisation. Vajpayee spent a lifetime trying to make his party displace the Congress from power, and to this end he switched between fighting the Congress’s tactics and mimicking them. If the Jana Sangh came to power as part of the Janata Party in 1977, it was in no small measure due to his readiness to mend fences and build bridges with former political opponents. Indeed, he became the acceptable public face of a party propelled by divisive forces. Whether he was a mere frontman, a ‘mask’ as one of his party colleagues described him, or a driver of change in an organisation with deep-seated prejudices, is difficult to tell; the truth lay somewhere in between. Vajpayee’s first hold on power was a stint as External Affairs Minister in the Janata government in 1977-79, where he made a bold effort to normalise relations with China. Subsequently, he had three stints as Prime Minister, a 13-day misadventure without the required support in 1996, a 13-month experiment with strange bedfellows in 1998-99, and a full term with a reasonably cohesive alliance during 1999-2004. The National Democratic Alliance that the BJP formed in 1998 would not have been possible without Vajpayee as the leader. His image as a moderate trying to rein in extremist elements in his party made it easier for others such as the Telugu Desam, the Trinamool Congress and the Dravida Munnetra Kazhagam to join the NDA. The BJP would not have come within sniffing distance of power without him, but he brought the party to power by keeping its most contentious issues, Ayodhya, Article 370, uniform civil code, out. It is a matter of debate whether Pokhran-II was a strategic mistake, an unnecessary concession to a hyper-nationalistic constituency, but there is no denying the remarkable maturity he displayed during the Kargil crisis in 1999. But the compromise man could not win a second substantive term. Forced as he was to carry on a delicate balancing act, he often came across as an indecisive and cautious Prime Minister, even if at times an endearing and loveable one. There was no way to judge whether he softened the BJP or the BJP toughened him. Perhaps it was a bit of both. contrarian: विपरीत - a person who opposes or rejects popular opinion, especially in stock exchange dealing. shrewd: चालाक - having or showing sharp powers of judgment; astute. acerbic: एसिड - (especially of a comment or style of speaking) sharp and forthright. mend: सुधार - a repair in a material. mere: मात्र - that is solely or no more or better than what is specified. stint: कार्यकाल - a person's fixed or allotted period of work. indecisive: दुविधा में पड़ा हुआ - not settling an issue. overhaul: पूरी जाँच करके मरम्मत करना - a thorough examination of machinery or a system, with repairs or changes made if necessary. infidelity: बेवफ़ाई - the action or state of being unfaithful to a spouse or other sexual partner. niggling: तुच्छ - cause slight but persistent annoyance, discomfort, or anxiety.